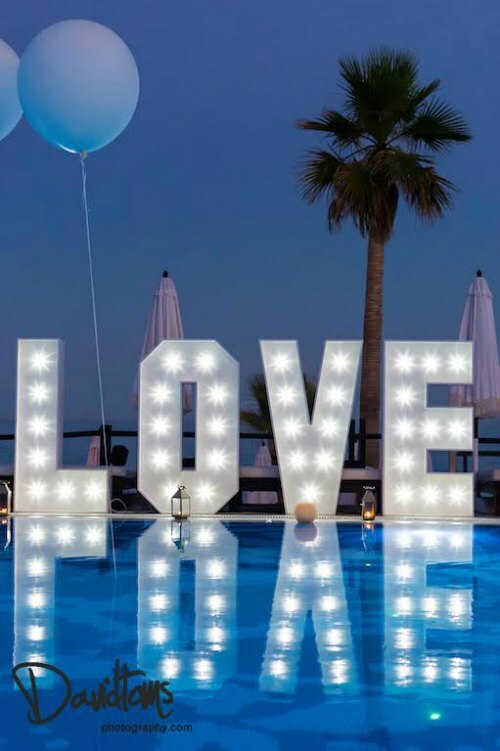 If you are looking for the perfect venue by the sea, close enough to the glitz and glamour of nearby Marbella but with a more relaxed and personal feel, then take a look at Stacey and Barry’s inspirational Estepona Beach Club wedding. The wedding couple already knew the area well, having visited the Costa del Sol many times and having eventually fallen so in love with the area that they purchased a holiday home nearby. But no matter how well you know the Spanish coast, when it comes to choosing the right wedding venue it is always worth asking the experts – which is where we were more than willing to help. As you can imagine, the Costa del Sol is awash with beach-side wedding venues for international couples wanting to make the most of the Spanish sun on their destination wedding – but it didn’t take long after having met this wonderful couple to know that we had found their perfect location. From afar this Beach Club looks like a tropical paradise. It sports a large thatched roof beside the long sandy beach and palm trees sway to the rhythm of the club’s chill out music. An impressive entrance filled with water features and pretty bridges makes way for an Ibizan-style all white elegant Estepona Beach Club wedding venue that is hard to top. The beauty of choosing such a sophisticated but unfussy venue is that you can make it your own and add your individual decorative touches – which is what Stacey and Barry did the day of their wedding. Stacey, originally Persian but having met Barry in Ireland, wanted a romantic vintage feel to her special day…and the venue stepped up to the occasion perfectly. The night before their wedding we arranged for Stacey and Barry’s guests to meet in a bar in the fun-packed port of Marbella, near their hotel. Here the guests not only enjoyed wonderful local vino in one of the coast’s most luxurious settings, but it also gave them the chance to get to know each other. Which meant that by the next day everyone was in full party spirit. On the day itself the friends and family of the couple stayed in the centre of Marbella and the wedding venue and destination was kept a big surprise. As the guests piled into the coaches we provided, the excitement was palpable as they looked up to the mountains and down at the sea with no idea as to where we were taking them. When, just twenty minutes, we pulled into the spectacular Estepona Beach Club wedding venue the look on their faces was priceless. Find out in Part 2 how Stacey and Barry managed to combine the fun of an Irish wedding and splendor of a Persian celebrations at their sunny Spanish Estepona beach club wedding.